This is the most famous country villa in the whole area around Mount Vesuvius. It can be reached on foot by following the modern road for a short way after leaving the Pompeii archaeological site proper (keep your ticket as this is also valid for entry to the Villa of Mysteries). The current entrance to the Villa is on the opposite side to the original portal which was situated about 400 metres from the Porta Ercolano gate along the road leading out of the town. 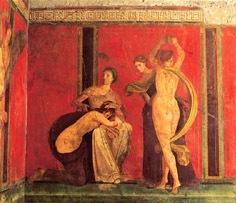 The villa owes its fame to the extraordinary wall paintings in the triclinium which make up an almost photographic sequence of theatrical scenes. The building can be divided into two areas. The main area is exclusively residential and was built in the 2nd century B.C. with the sole purpose of providing a luxurious and comfortable place in which to live. The other part is linked to the villa’s role as a working farm and hence was built with a view to accommodating the produce of the surrounding countryside. It was added onto the former building in the 1st century A.D.. In the farm area, on the right of the main entrance, archaeologists found the wine-press that was situated in the rooms were the wine was made. On the opposite side of the peristyle are the kitchens, two ovens in the courtyard, the lararium, and a large lavatory. Beyond the kitchen courtyard we find a bath-house dating from the pre-Roman era which was subsequently used as store rooms. These open onto a small four-columned atrium where we also find a number of smaller rooms decorated in the second style, including a cubiculum with two beds (double alcove). The tablinum is embellished with third style decorations on a black background depicting Egyptian figurines and miniaturised elements from the cult of Dionysus. The tablinum leads into a cubiculum whose original alcoves were made into doorways so as to convert the room into a corridor. The imitation marble decoration is superimposed with panel pictures portraying sacrificial scenes and fresco of Dionysus with a satyr and dancing maenads. These figures, along with the paintings of sculptures of a dancing satyr, the muse Calliope and Silenus with a hand-servant, set the scenes for the nearby ‘Triclinium of Mysteries’. The latter room, like almost all the residential part of the house, is situated on a three-sided cryptoporticus that had to be built because of the natural slope of the ground and so as to create a colonnade adjoining onto living rooms looking out onto the splendid view of the Gulf of Naples.